Mol. Cells. Jan 31, 2019; 42(1): 36-44. Alzheimer’s disease (AD) is the most frequent age-related human neurological disorder. The characteristics of AD include senile plaques, neurofibrillary tangles, and loss of synapses and neurons in the brain. β-Amyloid (Aβ) peptide is the predominant proteinaceous component of senile plaques. The amyloid hypothesis states that Aβ initiates the cascade of events that result in AD. Amyloid precursor protein (APP) processing plays an important role in Aβ production, which initiates synaptic and neuronal damage. δ-Catenin is known to be bound to presenilin-1 (PS-1), which is the main component of the γ-secretase complex that regulates APP cleavage. Because PS-1 interacts with both APP and δ-catenin, it is worth studying their interactive mechanism and/or effects on each other. Our immunoprecipitation data showed that there was no physical association between δ-catenin and APP. However, we observed that δ-catenin could reduce the binding between PS-1 and APP, thus decreasing the PS-1 mediated APP processing activity. Furthermore, δ-catenin reduced PS-1-mediated stabilization of APP. The results suggest that δ-catenin can influence the APP processing and its level by interacting with PS-1, which may eventually play a protective role in the degeneration of an Alzheimer’s disease patient. Alzheimer’s disease (AD) is the most frequent neurodegenerative disorder and cause of dementia in elders. It is characterized by senile plaques, neurofibrillary tangles, and loss of synapse and neurons in the brain. No effective treatments have been available to prevent, halt, or reverse the disease so far, perhaps because of the complex etiology of the condition, which appears to involve a variety of genetic and environmental factors (Blennow et al., 2006). A key factor is the amyloid precursor protein (APP), which is cleaved by four types of proteases, α-,β-,and γ-secretases and caspase(s), resulting in fragments with diverse biological activities (Berger-Sweeney et al., 1999; Gao and Pimplikar, 2001; Lu et al., 2003). Four proapoptotic peptides can be generated by the cleavage of APP at three different sites: soluble APPβ, β-amyloid (Aβ),Jcasp, and C31. More recent lines of evidence have raised the possibility that APP fragments other than Aβ may contribute to AD pathogenesis (Bredesen, 2009). Nowadays, drug development has been focused on reducing Aβ production and increasing its clearance from the brain (Mangialasche et al., 2010). APP is a ubiquitous, glycosylated, sulfated, and phosphorylated integral membrane protein. The amyloid hypothesis implies the presence of two distinct pathways for APP hydrolysis: the “amyloidogenic” and the “non-amyloidogenic” pathways (Sorrentino et al., 2014). The first pathway is initiated by the β-secretase enzyme, an identified aspartyl protease (BACE 1 and 2), which cleaves APP at the extracellular region. Subsequently, the cleavage of the transmembrane APP by β-secretase generates the C-terminal fragment of APP, C99, anchored in the plasma membrane (Pitsi and Octave, 2004). C99 is subsequently processed by Presenilin-1(PS-1)/ γ-secretase complex, generating the Aβ that accumulates in the brain of AD patients. It has been suggested that PS proteins play a catalytic core role in this proteolytic activity (Jeong, 2017; Pitsi and Octave, 2004). PSs are transmembrane proteins with at least six transmembrane regions (Doan et al., 1996). In vivo, the PS polypeptides are processed into amino- and carboxyl-terminal fragments with no detectable full-length PS. PS-1 is also known to incorporate into a high-molecular-weight γ-secretase complex by binding to other components, such as Nicastrin, Aph-1, and Pen-2. This PS processing can be saturated by overexpression of PS-1 in transfected cells or in PS-1-transgenic animals, although the physiological function of this cleavage is still under investigation (Czech et al., 1998; Thinakaran et al., 1996). Among many PS interacting proteins, δ-catenin belongs to the p120-catenin protein family, which is characterized by ten armadillo repeats that bind to the juxtamembrane segment of the classical cadherins such as E-cadherin. δ-Catenin is the only member of this family displaying a neuron-specific expression, where it binds to PDZ domain proteins in the post-synaptic compartment (Kosik et al., 2005). δ-Catenin is a neuron-specific catenin that has been implicated in adhesion and dendritic branching. Moreover, deletions of δ-catenin in human chromosome correlate with the severity of mental retardation in Cri-du-Chat syndrome, which may account for 1% of all mental retardation clinical cases (Medina et al., 2000). Interestingly, δ-catenin was first identified because of its interaction with PS-1, the molecule most frequently mutated in familial Alzheimer’s disease (Zhou et al., 1997). Apart from PS-1, δ-catenin is known to interact with the following proteins: E-cadherin (Lu et al., 1999), S-SCAM (Ide et al., 1999), P0071 (Deguchi et al., 2000), densin-180 and PSD-95 (Izawa et al., 2002), Abl (Lu et al., 2002), Erbin (Laura et al., 2002), cortactin (Martinez et al., 2003), sphingosine kinase (Fujita et al., 2004), Kaiso (Rodova et al., 2004), cdk5/p35 complex (Munoz et al., 2007), P190RhoGEF and Akt1 (Kim et al., 2008), GSK3α/β (Oh et al., 2009), Dynamin 2 (Koutras and Levesque, 2011), Caspase-3 and ZIFCAT (Gu et al., 2011), and Kazrin (Cho et al., 2011). δ-Catenin is known to be abundantly expressed in the brain and is implicated in the regulation of dendrogenesis and cognitive function. Its ten armadilo repeats (a 42-amino acid motif, described originally in a Drosophila segment polarity gene) indicate its potential participation in various protein-protein interactions (Kosik et al., 2005). The deficits in learning and memory, as well as synapse plasticity and morphology have been observed in δ-catenin deficient mice, which support the importance of δ-catenin in cognitive function and neural connectivity (Arikkath et al., 2009). Although the interaction between PS-1 and δ-catenin was observed, and APP is the substrate for PS-1, which is the main component of γ-secretase, combinations of these three proteins have not been well studied until now. In this study, we examined the relations between δ-catenin, APP, and PS-1. We showed that there is no physical association between δ-catenin and APP. Furthermore, we observed that δ-catenin could reduce not only the binding between PS-1 and APP but also the PS-1-mediated stabilization of APP. The results suggest that δ-catenin can influence the APP processing and its level by interacting with PS-1, which may suppress the progression of an Alzheimer’s disease. The construct of δ-catenin wild type (WT) in pEGFP-C1 has been previously described (Kim et al., 2002). The deletion constructs of 1–690 and 1–1070 were genertated by PCR-based EZchange site-directed mutagenesis kit (Enzynomics, Korea). The constructs of PS-1-HA, PS-1-GFP, C99-FLAG, C99-HA, dC99-FLAG, and dC99-HA (C-terminal 682–687 YENPTY deleted C99) were also generated by PCR. APP-myc plasmids were kindly provided by Professor Hee-Sae Park (School of Biological Sciences and Technology, Chonnam National University). The antibodies were purchased from commercial companies as follows: anti-δ-catenin (BD Bioscience and Upstate Biotechnology, #611537), anti-FLAG (Pierce, #F3165); anti-GFP (Clontech, Abcam, and Sigma, #G1544), anti-β-actin (Sigma, #A5441), anti APP-CT (Sigma, #A8717), anti-myc (Cell signaling, #2276). The HA epitope was detected with medium from 12CA5 hybridoma, which was provided by Professor Kwang Youl Lee (Chonnam National University). The Bosc23 cells were cultured in DMEM supplemented with 10% FBS and 1% penicillin/streptomycin at 37°C with 5% CO2. MEF (Mouse Embryonic Fibroblast) cells were grown in DMEM supplemented with 10% FBS and 1% penicillin/streptomycin at 37°C with 5% CO2. Bosc23 cells were transfected using PEI (polysciences, #24765-2), and MEF cells were transfected using Lipofectamine Plus reagent (Invitrogen, USA) according to the manufacturer’s instructions. Immunoblotting was performed on lysates from transfected cells. Cells were harvested in ice-cold MLB lysis buffer containing 25 mM HEPES, pH 7.5, 150 mM NaCl, 1% Nonidet P-40, 0.25% Na-deoxycholate, 10% glycerol, 25 mM NaF, 1 mM EDTA, 1 mM Na3VO4, 250 μM phenylmethylsulfonylfluoride, 10 μM/ml leupeptin, and 10 μM/ml protease inhibitor mixture. Cell lysates were quantified by using a protein assay to measure the protein concentration of each sample with the BCA kit (Pierce, USA). Next, 20 μg of each sample were loaded to a Tris-Glycine gel and electrophoresed. Proteins were transferred to a polyvinylidenedifluoride (PVDF) membrane (Millipore, USA). The membrane was cut according to the target proteins’ molecular weight and was activated with methanol. Then the cut membranes were blocked with 5% skim-milk buffer and probed with primary antibodies. Bound antibodies were visualized with horse-radish peroxidase-conjugated secondary antibodies by means of enhanced chemiluminescence Western blotting detection reagents (Millipore). Immunoprecipitation was performed by using lysates from transfected cells. Cells were lysed in MLB lysis buffer as describe above. Lysates were incubated with primary antibodies (applied amount of antibodies depended on what is suggested in datasheets) for 16 h at 4°C and pulled out with protein G sepharose (GE Healthcare, Sweden). The immunoprecipitated proteins were eluted at 95°C for 2 min with 15 μl of 2X sample buffer (0.1 M Tris-HCl, pH6.8, 0.2 M DTT, 4% SDS, 20% glycerol, 0.2% bromophenol blue, and 1.43 M β-mercaptoethanol) and analyzed by Western blotting as described above. Cycloheximide (CHX) was obtained from Sigma (#083M4019V) and, was dissolved in DMSO to make the stock concentration as 50 mg/ml. At 12 h after transfection, the cells were treated with 50 μM cycloheximide at 3 h, 6 h, 9 h, and 12 h. Then the cells were harvested after being treated for the specified time. Because δ-catenin binds to PS-1, which is the main γ-secretase for APP cleavage, it prompted us to investigate whether δ-catenin could bind to APP directly. Bosc23 cell line was used in following experiments. Bosc23 cell doesn’t express endogenous δ-catenin (data is not shown) and APP (C99) (Fig. 1A). To investigate the relationship between APP (C99) and δ-catenin, we transiently transfected Bosc23 cells with APP (C99) and δ-catenin-GFP plasmids, as indicated in Fig. 1B. Total cell lysates were immunoprecipitated with anti-δ-catenin antibody and subjected to immunoblotting analysis. There was no physical association between APP (C99) and δ-catenin, as shown in Fig. 1B. It has been previously reported that PS-1 C-terminal fragment (PS-1-CTF) can bind to δ-catenin (Tanahashi and Tabira, 1999). To investigate which region of δ-catenin is mainly responsible for binding to PS-1, we used different δ-catenin deletion mutants, including δ-catenin 1–690 and δ-catenin 1–1070, to map the region of δ-catenin that is essential for binding to PS-1. We transiently co-transfected Bosc23 cells with δ-catenin-GFP plasmids (WT, 1–690, or 1–1070) and PS-1 CTF, as indicated in Fig. 1C. We observed specific interacting bands between PS-1 CTF and δ-catenin WT or 1–1070 mutant, whereas δ-catenin 1–690 did not interacts. We previously reported that PS-1 could bind to δ-catenin and that APP (C99) interacts with PS-1, but no direct association between δ-catenin and APP was observed, as shown in Fig. 1B. To investigate whether PS-1, APP (C99) and δ-catenin form a complex we transiently transfected Bosc23 cells with C99-FLAG, δ-catenin-GFP and PS-1-HA plasmids. By using immunoprecipitation and immunoblotting, we found that there is no triple complex formation by these proteins in Bosc23 cells (Fig. 1D). Because APP (C99) is the substrate of PS-1, which is the main γ-secretase component, we investigated the effect of δ-catenin on the binding between APP (C99) and PS-1. As shown in Fig. 2A, the interaction between PS-1-HA and C99-FLAG decreased with the gradual increase of the δ-catenin-GFP expression in Bosc23 cells. To exclude the unexpected intervention of GFP for the interacting profile between PS-1-HA and C99-FLAG, we also used the untagged δ-catenin instead of δ-catenin-GFP for the same immunoprecipitation experiment; we observed a similar decrease of the interaction between PS-1-HA and C99-FLAG by δ-catenin expression (Fig. 2B). We also transfected the δ-catenin-GFP 1–1070, which interacted with PS-1-HA. As expected, the increased expression of δ-catenin-GFP 1–1070 reduced the interaction between PS-1-HA and C99-FLAG. These results suggest that δ-catenin interferes with the association between PS-1 and C99. In order to investigate how δ-catenin affects APP (C99) processing, we co-transfected APP (C99) plasmids and δ-catenin into Bosc23 cells. As shown in Fig. 3A, δ-catenin overexpression decreased both C99 protein level and C99 fragments in Bosc23 cells. We checked dC99 (YENPTY deleted C99) level in presence or absence of δ-catenin expression. It showed same pattern with C99 protein level. Since we found that δ-catenin could reduce C99 protein level and processing, we observed the APP full-length processing by δ-catenin expression. Similar to those of C99 by δ-catenin, APP full-length level and C99 level were reduced by δ-catenin expression (Fig. 3B). To further investigate the involvement of PS-1 in APP expression and processing by δ-catenin, we co-transfected APP (C99) and δ-catenin into PS-1, 2 +/+ and PS-1, 2 −/− cells. As shown in Fig. 3C, δ-catenin reduced both C99 protein level and C99 processing in PS-1, 2 +/+ cells, whereas there was no change in PS-1, 2 −/− cells. The pattern of dC99 protein level and processing was same in both cell lines. These data imply that δ-catenin can reduce APP (C99) protein level and processing, which is the main process for Aβ generation, in a PS-dependent way. To further investigate the role of δ-catenin on the C99 protein level and processing, two stable CWR22Rv-1 cell lines, designated as Rv/C and Rv/δ, that overexpress GFP and δ-catenin-GFP, respectively, were transfected with C99-HA or dC99-HA plasmids. Rv/δ cells showed lower expression of C99 protein levels than did Rv/C cells (Fig. 4A). A similar result was shown in the experiment with C99-FLAG expression plasmids (Fig. 4B). These data suggest that δ-catenin could reduce the C99 protein levels. PS-1 could stabilize the C-terminal fragment of APP (Pitsi and Octave, 2004). We gradually increased the expression of δ-catenin in APP (C99) and PS-1 co-transfected cells to find out whether δ-catenin is involved in the PS-1-mediated stabilization of C99. As Didier Pitsi et al (2004) indicated, C99 was more highly stabilized by PS-1 expression than by only the C99-expressing group. The stabilized C99 expression and C99 fragment by PS-1 were reduced by δ-catenin expression in a dose-dependent manner (Fig. 5). 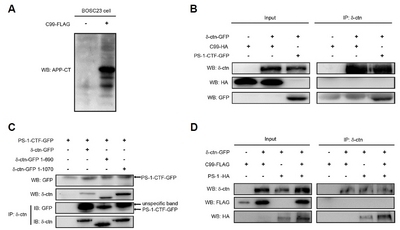 These results suggest that δ-catenin reduces the PS-1-mediated stabilization of C99. To examine whether δ-catenin decreases APP (C99) protein expression by diminishing its stability, we measured the protein half-life of APP (C99) in APP (C99) transfected cells or APP (C99)/ δ-catenin co-transfected cells with treating CHX for different times (0, 0.5, 3, 6, 9, and 12 h) after transfection for 24 h. As shown in Fig. 6A, APP (C99) protein disappeared quickly in δ-catenin-overexpressed cells compared to only C99-expressing cells. By quantitation, C99 and δ-catenin co-expressing cells showed a shorter half-life of APP (C99) (4.5 h) than those of only C99-expressing cells (8 h) (Fig. 6B). These data suggest that δ-catenin reduces the stability of APP (C99) by shortening its half-life of protein expression. In this study, we found relationship between δ-catenin, APP, and PS-1. First of all, we found that δ-Catenin cannot form a triple complex with PS-1 and APP (C99). Secondly, APP (C99) processing is decreased by δ-catenin by decreasing the binding affinity of APP (C99) to PS-1. Lastly, APP (C99) stability is decreased by δ-catenin. δ-Catenin has been shown to interact specifically with a hydrophilic loop region (amino-acid residues 299–407) in the endoproteolytic C-terminal fragments of PS-1. It is known that PS binds to APP and generates APP fragments, which lead to increased production of the amyloid peptide, Aβ 1–42 (42 amino acids) (Scheuner et al., 1996). However, the direct effect of δ-catenin on APP has not been studied as yet. In this report, we found that there was no physical association between δ-catenin and APP (C99) (Fig. 1). Furthermore, the domains of interaction between PS-1 and δ-catenin were elucidated as existing within the 691–1070 region (Fig. 2). Therefore, we hypothesized that δ-catenin forms a triple complex with APP (C99) via PS-1 proteins. However, our immunoprecipitation results showed that there was no complex formation between these three proteins (Fig. 1) despite the binding between APP (C99) and PS-1, as well as the binding between δ-catenin and PS-1. Then, we carried out immunoprecipitation by increasing the δ-catenin expression in APP- and PS-1-overexpressed cells to investigate the δ-catenin-mediated alteration in the interaction between APP (C99) and PS-1. Interestingly, we found that the association between PS-1 and APP (C99) was reduced significantly by gradual increases of δ-catenin in a dose-dependent manner, suggesting that δ-catenin competes with APP to bind to PS-1 and leaves less available PS-1 for APP (Fig. 3). Another possible regulatory mechanism for the reduced association between APP (C99) and PS-1 by δ-catenin could be a recruitment of PS-1 into cadherin instead of APP. It has been known that δ-catenin can recruit more PS-1 to cadherin (Jun et al., 2012). Therefore, overexpression of δ-catenin might recruit more PS-1 approaching to cadherin, making it less available for the APP (C99), leading to the reduced association between APP (C99) and PS-1. It was proved that PS-1 stabilizes the C-terminal fragment of APP, regardless of γ-secretase activity (Pitsi and Octave, 2004). In the presence of PS-1, C99 stability was increased more than with PS-1-null cells (Fig. 3C). According to study by Didier (Pitsi et al., 2004), binding of PS1 to C99 does not necessarily lead to its immediate cleavage by γ-secretase, which could be a spatio-temporally regulated or an induced event. PS1 stabilizes C99 and, thus, could play a key role as a chaperone regulating the transport of C99, protecting it from proteolytic degradation pathways, and increasing its availability for γ-secretase, which induces the increase in Aβs production. But in the presence of δ-catenin, the lower C99 level is shown in Fig. 4, perhaps because, in the presence of δ-catenin, more PS-1 may bind to δ-catenin instead of to APP (C99), leading to less stability of APP (C99). It is sure that PS-1 plays a key role in Aβ production. But further studies should be performed to shed light on its function and ability to influence the steady state of C99. δ-Catenin can reduce PS-1-mediated stabilization of the C99 in Bosc23 cells and thus lead to less C99 cleavage. A proposed model about relations between PS-1, APP and δ-catenin was illustrated in Fig. 7. Amyloidogenic pathway is responsible for generating Aβ. In the absence/low level of δ-catenin, APP can be easily cleaved by γ-secretase (PS-1). However, in the presence of δ-catenin, δ-catenin competes with APP to bind γ-secretase (PS-1). Therefore, APP is less stable and processed, and its degradation is facilitated. 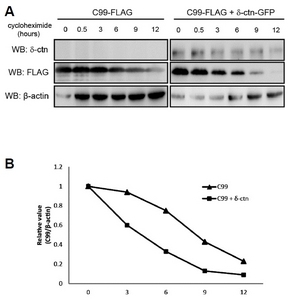 δ-Catenin decreased proteins level of full length PS-1 and PS-1-CTF (around 25kDa) as well as C99-FLAG (Fig. 5). PS-1 interacts with member of the cadherins/δ-catenin complexes to regulate synaptic differentiation, apoptosis and degenerative processes (Patapoutian and Reichardt, 2000). By the same mechanism Didier Pitsi et al (2004) proposed for APP by PS-1, APP-bound PS-1 can be a more stable form compared to either its complex form with its other substrates such as E-cadherin or its unbound form. The re-localization of PS-1 into other substrates and/or changes in its catalytic γ-secretase activity by overexpressed δ-catenin can be possible mechanism how δ-catenin decrease the amounts of full length PS-1 (around 50kda) and PS-1-CTF (around 20–25 kda) as well as the C99. Further study requires to figure out the exact mechanism how δ-catenin decreases PS-1 and PS-1-CTF level. Taken together, our results show that δ-catenin plays a critical role in reducing APP (C99) protein level and APP (C99) processing by its interaction with PS-1, thus inhibiting the interaction between APP (C99) and PS-1 and potentially reducing the production of Aβ 1–42, a key step toward developing a treatment for AD. Although the mechanism is not clear, the results in this study could be promising for the study of AD, since this is the first elucidation of the competition between δ-catenin and APP (C99). Mol. Cells.Jan 31, 2019; 42(1): 36-44. Received June 25, 2018; Accepted October 18, 2018. Arikkath, J., Peng, I.F., Ng, Y.G., Israely, I., Liu, X., Ullian, E.M., and Reichardt, L.F. (2009). Delta-catenin regulates spine and synapse morphogenesis and function in hippocampal neurons during development. J Neurosci. 29, 5435-5442. Berger-Sweeney, J., McPhie, D.L., Arters, J.A., Greenan, J., Oster-Granite, M.L., and Neve, R.L. (1999). Impairments in learning and memory accompanied by neurodegeneration in mice transgenic for the carboxyl-terminus of the amyloid precursor protein. Brain Res Mol Brain Res. 66, 150-162. Blennow, K., de Leon, M.J., and Zetterberg, H. (2006). Alzheimer’s disease. Lancet. 368, 387-403. Bredesen, D.E. (2009). Neurodegeneration in Alzheimer’s disease: caspases and synaptic element interdependence. Mol Neurodegener. 4, 27. Cho, K., Lee, M., Gu, D., Munoz, W.A., Ji, H., Kloc, M., and McCrea, P.D. (2011). Kazrin, and its binding partners ARVCF- and delta-catenin, are required for Xenopus laevis craniofacial development. Dev Dyn. 240, 2601-2612. Czech, C., Lesort, M., Tremp, G., Terro, F., Blanchard, V., Schombert, B., Carpentier, N., Dreisler, S., Bonici, B., and Takashima, A. (1998). Characterization of human presenilin 1 transgenic rats: increased sensitivity to apoptosis in primary neuronal cultures. Neuroscience. 87, 325-336. Deguchi, M., Iizuka, T., Hata, Y., Nishimura, W., Hirao, K., Yao, I., Kawabe, H., and Takai, Y. (2000). PAPIN. A novel multiple PSD-95/Dlg-A/ZO-1 protein interacting with neural plakophilin-related armadillo repeat protein/delta-catenin and p0071. J Biol Chem. 275, 29875-29880. Doan, A., Thinakaran, G., Borchelt, D.R., Slunt, H.H., Ratovitsky, T., Podlisny, M., Selkoe, D.J., Seeger, M., Gandy, S.E., and Price, D.L. (1996). Protein topology of presenilin 1. Neuron. 17, 1023-1030. Fujita, T., Okada, T., Hayashi, S., Jahangeer, S., Miwa, N., and Nakamura, S. (2004). Delta-catenin/NPRAP (neural plakophilin-related armadillo repeat protein) interacts with and activates sphingosine kinase 1. Biochem J. 382, 717-723. Gao, Y., and Pimplikar, S.W. (2001). The gamma-secretase-cleaved C-terminal fragment of amyloid precursor protein mediates signaling to the nucleus. Proc Natl Acad Sci USA. 98, 14979-14984. Gu, D., Tonthat, N.K., Lee, M., Ji, H., Bhat, K.P., Hollingsworth, F., Aldape, K.D., Schumacher, M.A., Zwaka, T.P., and McCrea, P.D. (2011). Caspase-3 cleavage links delta-catenin to the novel nuclear protein ZIFCAT. J Biol Chem. 286, 23178-23188. Ide, N., Hata, Y., Deguchi, M., Hirao, K., Yao, I., and Takai, Y. (1999). Interaction of S-SCAM with neural plakophilin-related Armadillo-repeat protein/delta-catenin. Biochem Biophys Res Commun. 256, 456-461. Izawa, I., Nishizawa, M., Ohtakara, K., and Inagaki, M. (2002). Densin-180 interacts with delta-catenin/neural plakophilin-related armadillo repeat protein at synapses. J Biol Chem. 277, 5345-5350. Jeong, S. (2017). Molecular and cellular basis of neurodegeneration in Alzheimer’s disease. Mol Cells. 40, 613-620. Jun, G., Moncaster, J.A., Koutras, C., Seshadri, S., Buros, J., McKee, A.C., Levesque, G., Wolf, P.A., St George-Hyslop, P., and Goldstein, L.E. (2012). delta-Catenin is genetically and biologically associated with cortical cataract and future Alzheimer-related structural and functional brain changes. PLoS ONE. 7, e43728. Kim, H., Han, J.R., Park, J., Oh, M., James, S.E., Chang, S., Lu, Q., Lee, K.Y., Ki, H., and Song, W.J. (2008). Delta-catenin-induced dendritic morphogenesis. An essential role of p190RhoGEF interaction through Akt1-mediated phosphorylation. J Biol Chem. 283, 977-987. Kim, K., Sirota, A., Chen Yh, Y.H., Jones, S.B., Dudek, R., Lanford, G.W., Thakore, C., and Lu, Q. (2002). Dendrite-like process formation and cytoskeletal remodeling regulated by delta-catenin expression. Exp Cell Res. 275, 171-184. Kosik, K.S., Donahue, C.P., Israely, I., Liu, X., and Ochiishi, T. (2005). Delta-catenin at the synaptic-adherens junction. Trends Cell Biol. 15, 172-178. Koutras, C., and Levesque, G. (2011). Identification of novel NPRAP/delta-catenin-interacting proteins and the direct association of NPRAP with dynamin 2. PLoS ONE. 6, e25379. Laura, R.P., Witt, A.S., Held, H.A., Gerstner, R., Deshayes, K., Koehler, M.F., Kosik, K.S., Sidhu, S.S., and Lasky, L.A. (2002). The Erbin PDZ domain binds with high affinity and specificity to the carboxyl termini of delta-catenin and ARVCF. J Biol Chem. 277, 12906-12914. Lu, D.C., Soriano, S., Bredesen, D.E., and Koo, E.H. (2003). 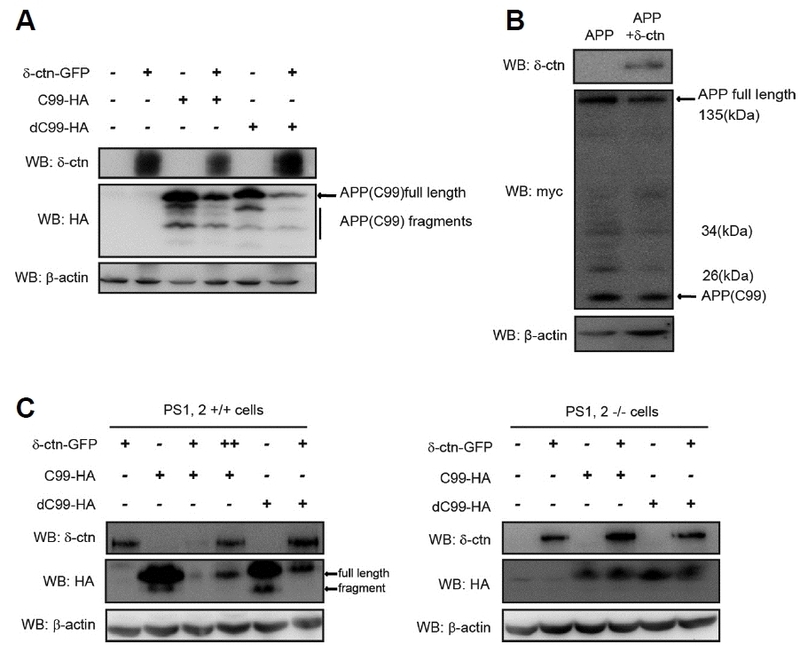 Caspase cleavage of the amyloid precursor protein modulates amyloid beta-protein toxicity. J Neurochem. 87, 733-741. Lu, Q., Mukhopadhyay, N.K., Griffin, J.D., Paredes, M., Medina, M., and Kosik, K.S. (2002). Brain armadillo protein delta-catenin interacts with Abl tyrosine kinase and modulates cellular morphogenesis in response to growth factors. J Neurosci Res. 67, 618-624. Lu, Q., Paredes, M., Medina, M., Zhou, J., Cavallo, R., Peifer, M., Orecchio, L., and Kosik, K.S. (1999). delta-catenin, an adhesive junction-associated protein which promotes cell scattering. J Cell Biol. 144, 519-532. Martinez, M.C., Ochiishi, T., Majewski, M., and Kosik, K.S. (2003). Dual regulation of neuronal morphogenesis by a delta-catenin-cortactin complex and Rho. J Cell Biol. 162, 99-111. Medina, M., Marinescu, R.C., Overhauser, J., and Kosik, K.S. (2000). Hemizygosity of delta-catenin (CTNND2) is associated with severe mental retardation in cri-du-chat syndrome. Genomics. 63, 157-164. Munoz, J.P., Huichalaf, C.H., Orellana, D., and Maccioni, R.B. (2007). cdk5 modulates beta- and delta-catenin/Pin1 interactions in neuronal cells. J Cell Biochem. 100, 738-749. Oh, M., Kim, H., Yang, I., Park, J.H., Cong, W.T., Baek, M.C., Bareiss, S., Ki, H., Lu, Q., and No, J. (2009). GSK-3 phosphorylates delta-catenin and negatively regulates its stability via ubiquitination/proteosome-mediated proteolysis. J Biol Chem. 284, 28579-28589. Patapoutian, A., and Reichardt, L.F. (2000). 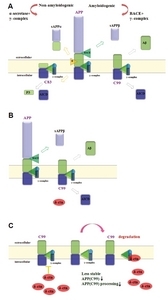 Roles of Wnt proteins in neural development and maintenance. Curr Opin Neurobiol. 10, 392-399. Pitsi, D., and Octave, J.N. (2004). 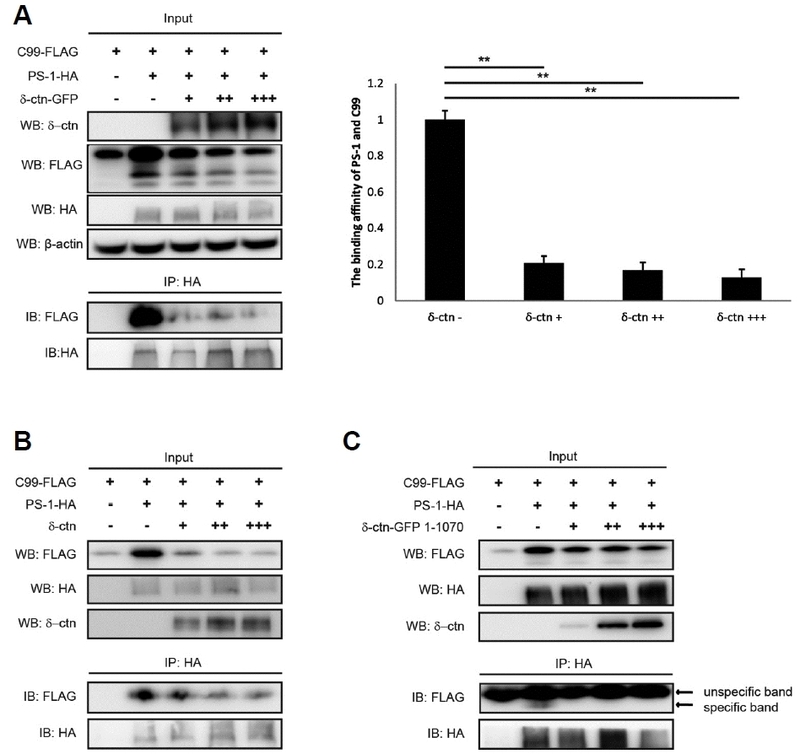 Presenilin 1 stabilizes the C-terminal fragment of the amyloid precursor protein independently of gamma-secretase activity. J Biol Chem. 279, 25333-25338. Rodova, M., Kelly, K.F., VanSaun, M., Daniel, J.M., and Werle, M.J. (2004). Regulation of the rapsyn promoter by kaiso and delta-catenin. Mol Cell Biol. 24, 7188-7196. Scheuner, D., Eckman, C., Jensen, M., Song, X., Citron, M., Suzuki, N., Bird, T.D., Hardy, J., Hutton, M., and Kukull, W. (1996). Secreted amyloid beta-protein similar to that in the senile plaques of Alzheimer’s disease is increased in vivo by the presenilin 1 and 2 and APP mutations linked to familial Alzheimer’s disease. Nat Med. 2, 864-870. Sorrentino, P., Iuliano, A., Polverino, A., Jacini, F., and Sorrentino, G. (2014). The dark sides of amyloid in Alzheimer’s disease pathogenesis. FEBS Lett. 588, 641-652. Tanahashi, H., and Tabira, T. (1999). Isolation of human delta-catenin and its binding specificity with presenilin 1. Neuroreport. 10, 563-568. Thinakaran, G., Borchelt, D.R., Lee, M.K., Slunt, H.H., Spitzer, L., Kim, G., Ratovitsky, T., Davenport, F., Nordstedt, C., and Seeger, M. (1996). Endoproteolysis of presenilin 1 and accumulation of processed derivatives in vivo. Neuron. 17, 181-190. Zhou, J., Liyanage, U., Medina, M., Ho, C., Simmons, A.D., Lovett, M., and Kosik, K.S. (1997). Presenilin 1 interaction in the brain with a novel member of the Armadillo family. Neuroreport. 8, 2085-2090. (A) C99-FLAG plasmid was transfected in Bosc23 cells. Immunoblotting was performed with amyloid precursor protein C-terminal specific antibody (APP-CT). (B) δ-catenin-GFP, C99-HA or PS-1-CTF-GFP was transfected into Bosc23 cells. After getting lysates we carried out immunoprecipitation with anti- δ-catenin antibody and immunoblotting with anti- δ-catenin, HA, and GFP antibodies. (C) δ-Catenin-GFP, δ-catenin-GFP 1–690 or δ-catenin-GFP 1–1070 was transfected with PS-1-CTF-GFP into Bosc23 cells. The transfected cells were harvested to perform immunoprecipitation with anti- δ-catenin antibody followed by immunoblotting with anti- δ-catenin or GFP antibodies. 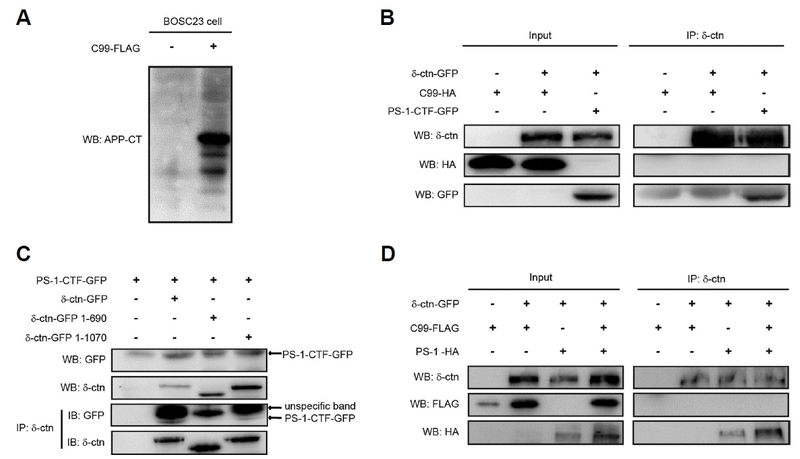 (D) Different combinations of δ-catenin-GFP, C99-FLAG or PS-1-HA were transfected into Bosc23 cells. Immunoprecipitation with anti δ-catenin antibody was performed followed by immunoblotting with anti- δ-catenin, FLAG and HA antibodies. (A–C) Bosc23 cells were transfected with C99-FLAG, PS-1-HA and the increasing amount of (A) δ-catenin-GFP, (B) δ-catenin, or (C) δ-catenin-GFP 1–1070, respectively. Immunoprecipitation with anti-HA antibody followed by immunoblotting with anti- FLAG and HA antibody. (A) The density of protein bands was measured by Multi Gauge v3.1 software. The bars represent the relative value of the protein density of binding between APP (C99) and PS-1 normalized by the value of C99-FLAG and PS-1 WT-HA transfected group. (A) Bosc23 cells were transfected with different combinations of δ-catenin, C99-HA or dC99-HA. The cell lysates were subjected to immunoblotting analysis using appropriate antibodies. (B) Bosc23 cells were transfected with APP full-length-myc in the absence or presence of δ-catenin. After transfection, total cell lysates were subjected to immunoblotting analysis using appropriate antibodies. (C) PS-1/2 +/+ or −/− MEF cells were co-transfected with δ-catenin and C99-HA or dC99-HA. Total cell lysates were used for immunoblotting analysis with appropriate antibodies. 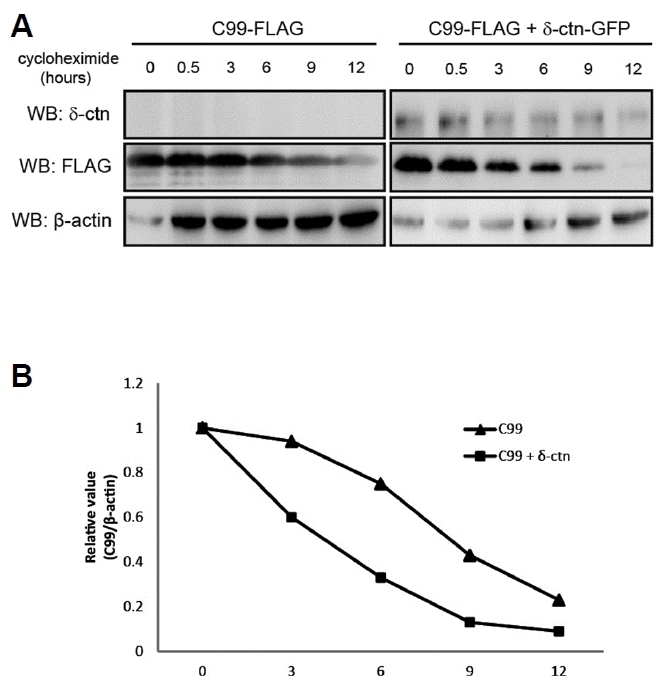 (A, B) Rv/C and Rv/δ CWR22Rv-1 cell lines were transfected with (A) C99-HA or dC99-HA and (B) C99-FLAG, respectively. After transfection, total cell lysates were subjected to immunoblotting analysis using appropriate antibodies. Bosc23 cells were transfected with APP (C99), PS-1-HA and the increasing amount of δ-catenin-GFP. The cell lysates were subjected to immunoblotting analysis with specific antibodies as indicated. The bar graph represents the relative value of the protein density of C99 compared to the only C99-transfected group. (A) Bosc23 cells were transfected with C99-FLAG only and C99-FLAG together with δ-catenin-GFP. After transfection for 24 h, the cells were treated with CHX 50 μM for different durations, as indicated. The cell lysates were collected and subjected to immunoblotting analysis using different specific antibodies. (B) Protein density in Western blotting was measured by Multi Gauge, and the protein level of C99-FLAG was normalized by the protein level of β-actin. The graph represents the relative value of the protein level of C99-FLAG in the absence or presence of δ-catenin as compared to each CHX 0 h group. (A) The non-amyloidogenic and amyloidogenic pathways. The amyloidogenic pathway gives rise to Aβ (B) In the absence or low level of δ-catenin; γ-secretase can bind to C99 and make C99 more stable, so more C99 is available for γ-secretase cleavage, which leads to the production of Aβ. (C) If δ-catenin is present, it competes with C99 to bind to γ-secretase, thus inhibiting the binding of γ-secretase to C99, which makes C99 less stable and thus facilitates its degradation. The less C99 there is, less C99 processing takes place, so there is thus less Aβ generation.